Home » Destinations » India » Tamil Nadu » Why Tea Nest is the gateway to the clouds! A blissful escape from urban life isn’t complete without an awesome stay. Recently, we were invited by Nature Group Resorts to experience a stay in their properties located in Coonoor. Out of all the properties we visited there, this particular homestay called Tea Nest Annex truly was breathtaking. The view from the property and the clouds in front constantly moving and changing their shapes were creating magic in the sky. The scene was so mesmerizing that we could sit there and look at the sky for hours together. l guess it won’t be wrong if we say that heaven felt closer to us. Tea Nest annex is located amidst a large tea estate of around 1800 acre and is 20 km away from Ooty at the top of a small hillock in Coonoor. Winding roads, lush green tea estates, the aroma of freshly plucked tea lying by the roadside and the view of the Nilgiri hills add to the mystical charm of this weekend destination. 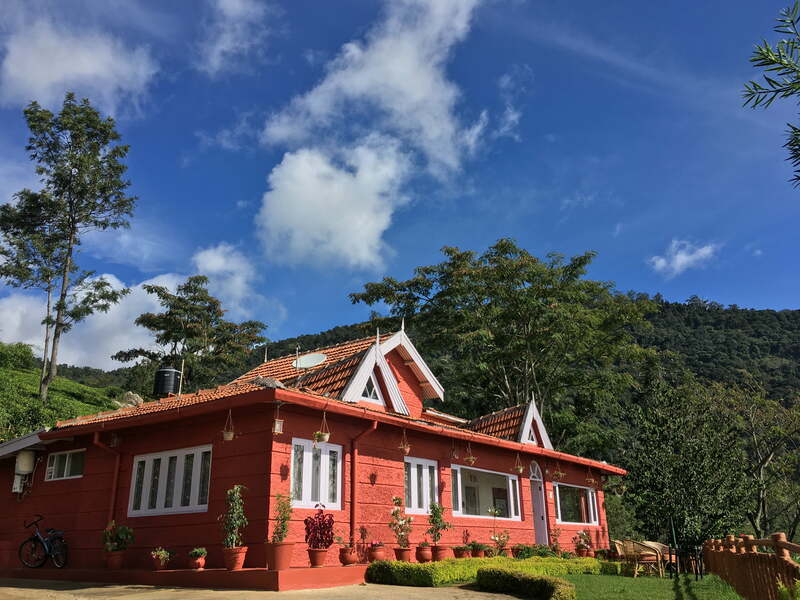 Tea Nest Annexe is housed in a quaint, cozy little bungalow, built almost 26 years ago with 2 large and spacious rooms named Rosemary and Basil with adjoined washroom and a seating area. You will find all the necessary amenities and beverages, cookies kept inside the room including a mix of special Ooty chocolates to enjoy. At first, the intention behind building the place was for the manager to stay there with his family so that it’s was easier for him to look after the estate but now the estate owners have leased it out to Nature Resorts who manages the hotel. We arrived at the property around 11.30am and we’re offered with a welcome drink made from their local and organic tea. There was a small garden area outside with a table and chairs for those who wish to sit there while having their breakfast/ lunch with a view of the hills. The air here was so clean & pure. The colours of the landscape around us consisted of hues of green and blues which made the sights so fresh. As we settled in, lunch was served on the portico outside the bungalow. It was a little chill as there was a slow breeze and from behind the trees, we saw a group of clouds coming into the property. I remember running out to the gate hoping to feel the clouds and enjoy the moment and as I looked behind I saw the manager standing at the entrance with a strange expression like he was quiet amused as for them this is a regular sight, every single day. Lunch had been really heavy so we decided to take a stroll through the tea plantation in the evening as the weather was just so great. We went at the top of the hill until we reached a viewpoint through which you could see the whole of Mettupalayam city. How could we miss clicking pictures there. Of course, we did some photo shoots so that we could share them with you. That night in Annex it was cold and quiet. There was no noise of the traffic or people – just grazing sounds of some bison nearby. The next morning was bright and sunny, hence we decided to take the cycles out and go cycling on those curvy scenic roads. This has so far been one of my best cycling experience. I guess it’s the roads and the flying clouds that made it so special. Imagine riding your cycle on a road like this and the clouds covering your view leaving you clueless where you are heading to? Soon after our cycling session we were served some nice breakfast cooked by the Nepalese chef who is truly an exceptional. I still remember the taste of the dal he served us for lunch the previous day. Witnessing a magical view along with finger licking food in the table – What more can you ask for? This place is perfect for those looking for plantation trails or for people who would just like to relax, soak in some sun while watching the clouds float by. A great destination for couples and parents. The property is small but it’s a whole world in itself with plenty to do if you are a nature lover! More reviews about the property here! Thank you for reading and for the kind words! !